The entire crew spends months preparing for a show, starting even before the actors show up. These people all have individual backgrounds and stories and rarely receive the credit they deserve. HSJI Newsroom goes backstage to meet the people that make the program what it is. Abby Tauber, an assistant production manager for the Summer Theatre, has been involved in the backstage crew since she was in middle school. Tauber explained that her sister was an actress, and although she herself loved acting, she didn’t love being the center of attention. “They were having openings for backstage crew for middle school and then just continued through high school,” Tauber said. Now, poised to start her senior year at Indiana University this fall, Tauber has continued to stay immersed in theatre culture, pursuing an arts management degree from SPEA and working on stage management crews for shows throughout IU’s theatre and dance season. Tauber is not the only crew member with a story to tell, as at the Indiana University Summer Theatre Program, many different professionals work together to help put on three full scale productions during the month of July. The three shows are performed by IU students and professional equity actors. 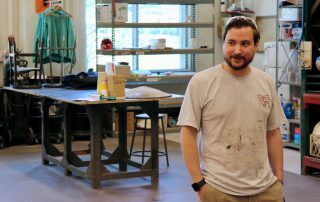 Chris Mueller, props master for the IU summer theatre program, first ignited his passion for theatre in elementary school. 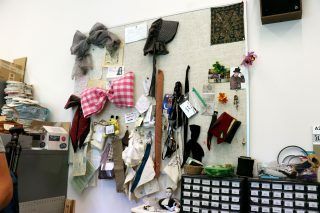 Eventually, Stanton made the decision to stay for an extra year in college and obtain a bachelor of arts degree in theatre, and he has been working in the costuming and design field since he finished college. He noted that his pre-med background can often still come in handy when fitting actors for costumes and dealing with different body compositions. These are just some of the people who have found a lifelong profession in the theatre world. While each person’s path that lead them to working at the Wells-Metz theatre this summer is different, they all work hard to help create a successful summer showcase. As audience file into their seats they see how the seats are placed around the stage as if it were an arena. Along with the stage placement they witness the props and costumes designs transport them into the world of theatre. In this new world there are certain aspects that can take a plain black box and change it into something spectacular. Rising senior Abby Tauber explains the different set arrangements. By having different stage placements, it makes the production look different from any other. There are four different types of stage placements such as; proscenium (a traditional stage setting), thrust (audience on three sides) and theatre in-the rounds (also called arena style). Stage placement is one aspect in creating different realities within the industry. Other aspects include the arts of costume and set designs. The creation of props and sets can take up to five days which depends on what is needed for a certain scene, set, and/or production. “Either materials are in stock or can be easily be purchased,” Mueller said. For certain products that are needed for a certain scene or production could be easily found in our everyday lives instead of creating anew, which helps the prop manufactures stay within the budget. “For a production called ‘The Foreigner,’ the cast has to tear apart napkins which can be easily be replaced by purchasing another package from the store,” Mueller said.Some props can be manufactured and then later stored for another use or production. “For ‘The Foreigner,’ I made a chandelier that can be used in later productions instead of making a new one,” Mueller said. Both set and costumes designs are similar in more than one way. Like Mueller, Costume Supervisor Robbie Stanton must work within budgets and tight scheduling. Without both set and costume designs the transformations aren’t possible and a production would not be to open on opening night. 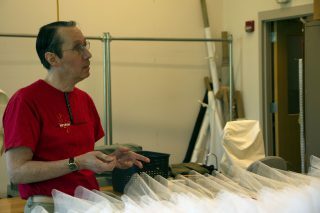 Robbie Stanton, the costume studio supervisor is making petticoats for the actresses while he explains his role in the IU theatre productions. Robbie manages the designs at Wells-Metz Theater. Noah Chaplin Photo​​. Without communication actors/actresses may get a costume that makes them uncomfortable or may not even fit and it would fall back on the designers. By having communication, deadlines are met, and both the designer and actor are happy with the final pieces. At times, actors are able to help come up with costume designs that will fit the roles, show how the characters are being portrayed, sometimes are able work hands-on with the designer in creating their costume. “When creating the outfit for Coneybear, a character from ‘The 25th Annual Putnam County Spelling Bee,’ we actually had the actor help in creating his shirt and made him draw on his shoes to make sure it looks like he actually made his own clothing,” Stanton said. Stage placement, set design and clothing design collectively create a new world within each production making the audience feel as if they were in the same place and time as the characters. This brings a new meaning to the world of creativity.